It happened. Maybe it was a sports injury, a bite from an apple or your child’s head slamming into your mouth, but whatever the cause, you find yourself holding your tooth in your hand. Before you panic, know that in many cases a knocked out tooth can be saved and reimplanted. You just have to act fast. The first thing you want to make sure of is that you are holding the tooth by the crown and not the root. The roots are fragile and, if damaged, are beyond repair. If it is dirty, rinse the tooth in water. If you have the option to use salt water, saline or milk to rinse it, use one of those instead. It’s better to use a bowl for rinsing, or at least run the water in a very slow and gentle stream, because even a rush of water can harm the root. Make sure not to brush or scrape at the tooth while cleaning it. Also, do not use any soap, toothpaste or any other chemicals. Finally, do not dry the tooth when you are finished under any circumstances. If your mouth is still bleeding, apply gauze and press until the bleeding subsides. You can use ice for pain or swelling of the gums. 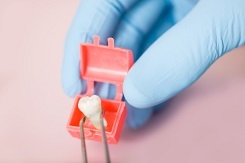 Now that you are holding the tooth by the crown and it is clean, you can try putting the tooth back into its socket. Position it in the correct space and bite down gently. You can use some gauze or even a moistened tea bag to bite down on. If for some reason it is not possible to reinsert the tooth, put the tooth in a container with some whole milk or with saliva. The tooth must be kept moist at all times in order to save it, but do not submerge or store it in plain water. Another option you have is to stick the tooth behind your lower lip so it is nestled between your lip and gum. This will keep it wet. Some first aid kits have a container in them with fluid made specifically to save knocked out teeth. Check and see if you have one of these. If you do, use it. This fluid will usually save the tooth for longer than the other methods. Now, you should immediately head to your dentist, or any nearby dentist, with your tooth. Get there as fast as possible for the best odds of being able to reimplant your original tooth. Remember, your tooth is alive, but it starts to die 15 minutes after it is removed from the body. Keeping it moistened with saliva or whole milk extends its life somewhat. If you have a tooth saving product in your first aid kit, it can live on for about a day, but you still need to seek medical attention as quickly as possible for the best odds. If you have already put your tooth back in place, you actually took the first step to reimplanting it. The dentist will then make sure it is in the right spot and splint it to the adjacent teeth with clear plastic or wire to hold it steady while it heals. If the dentist tells you your tooth cannot be saved, do not despair. You will have options such as a bridge, an implant or a denture. Please note that if it is a child that has lost a tooth, and it is a baby tooth, you should not try to place the tooth back in its socket. If this tooth reimplants, it can harm the bud of the new adult tooth. Store the tooth using one of methods outside of the mouth and seek the advice of a pediatric dentist. In most cases, the baby tooth will simply be left out and that area will remain toothless until its permanent replacement grows in. Since all children lose their teeth at some point and have to go without them while waiting for the new ones, this is not usually so bad. Most times, dental avulsion is something that happens by surprise and there is no way to avoid it. However, there are some things you can do to lesson your chances of it happening. For example, it is a fact that in sports more than five million teeth are knocked out each year and athletes without mouth guards are 60 times more likely to suffer dental injuries. If you play contact sports, you should be sure to wear a mouth guard. When it comes to food, try not to bite down on hard candies, stale bread or bones. Finally, always be sure to wear your seat belt when in a vehicle to avoid tooth loss resulting from sudden impact in the event of an accident.